The Seahawks are back in the playoffs after a one-year hiatus. Will this be a start of a playoff run, or will the Cowboys send Seattle home one-and-done? Russell Wilson vs. Dak Prescott. 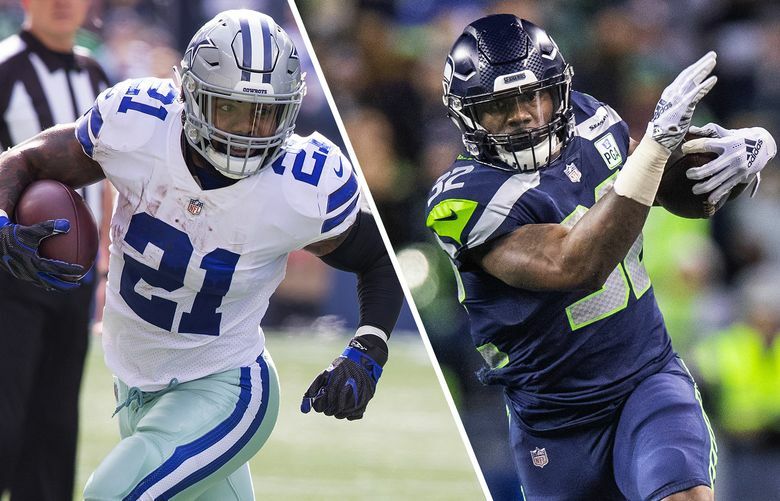 Chris Carson vs. Ezekiel Elliott. It's the NFC wild-card game. We're bringing you live updates, highlights and analysis from AT&T Stadium. 9:43 | Cowboys 17, Seahawks 14 With the Cowboys on Seattle’s doorstep, looking to make this a two-score game, Seattle’s defense make a HUGE play. K.J. Wright comes down with the interception in the end zone. 12:28 | Cowboys 17, Seahawks 14 Back and forth, we go. The Cowboys drive 67 yards and give it to Ezekiel Elliott to punch it in and retake the lead. That, after Dak Prescott got in for a TD but was ruled short after replay review. And the @dallascowboys have the lead once again. 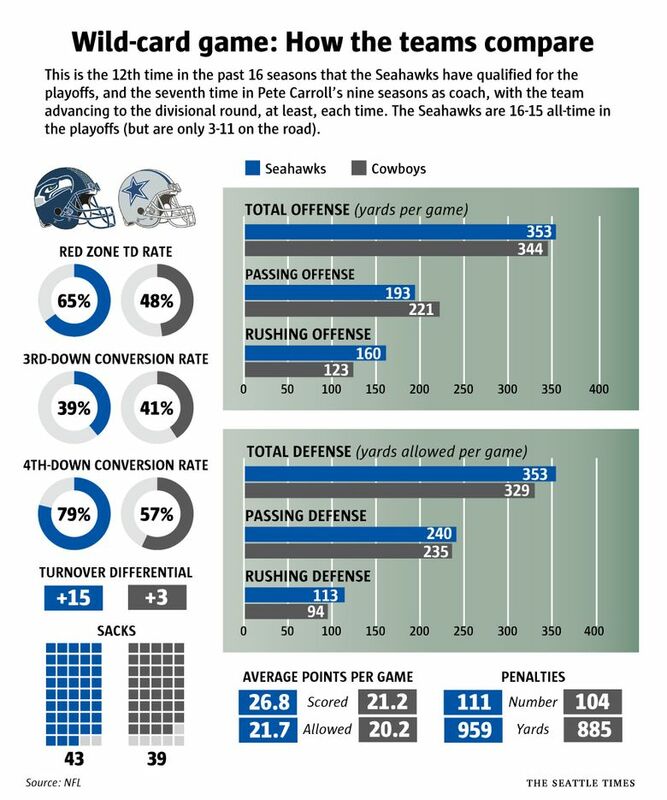 This sorta looks like an awful lot of Seahawks games of the Carroll/Wilson era — the slow start, the feeling out process on offense, the defense making some halftime adjustments and then Seattle holding on for the win. Doug Baldwin’s catch was amazing, as good as any he has had in his career and especially considering the playoff context. Bobby Wagner’s third and one stop on Ezekiel Elliott was a really big early play. Dallas seemed ready to take control, having just stopped Seattle, and had a chance to run some clock, if nothing else. Wagner’s stop led to the series of events that ended in Seattle’s first TD and taking the lead. 1:59 | Seahawks 14, Cowboys 10 After Russell Wilson finds Doug Baldwin down the sideline for a spectular fourth-down conversion, the Seahawks pound it in to retake the lead. Wilson keeps the read option to finish it himself, then Mike Davis converts the two-point attempt to make it a four-point game. 8:04 | Cowboys 10, Seahawks 6 With the way this one is going, plays like these could be the difference. The Seahawks still can’t get anything going offensively, but they’re able to pin Dallas against its goal line with a tremendous play by Neiko Thorpe. Dallas is just not letting Seattle run, holding the Seahawks to a net of 22 rushing yards on 10 attempts. Seattle is going to have to win this game through the air, as did against Carolina in November. Shaquill Griffin seems far from 100 percent, battling an ankle injury suffered last week and Dallas appears to be testing him. Griffin and Akeem King also lost containment on the long run by Elliott that set up Dallas’ touchdown. Seattle gets the ball first to start the third quarter. This seems like maybe the most important series of the season. 0:00 | Cowboys 10, Seahawks 6 After Tyler Lockett returned the kickoff 50 yards to midfield, Sebastian Janikowski got an attempt from 57 yards. But not only is he no good, he comes up grasping his hamstring. His return is questionable. Michael Dickson has been practicing field goals on the sideline. UPDATE: Janikowski has been ruled out. Here’s more from Bob Condotta in Dallas. 0:24 | Cowboys 10, Seahawks 6 A bad drive for Shaquill Griffin allows the Cowboys to respond after the Seahawks’ field goal. First, he and Akeem King fail to contain Ezekiel Elliott, who goes 41 yards. Then, Dak Prescott takes advantage of him on a fade to Michael Gallup for the game’s first touchdown. 1:43 | Seahawks 6, Cowboys 3 Russell Wilson’s perfect passer rating targeting Tyler Lockett won’t stop: Check out this highlight-reel catch from Lockett, which sets up a Sebastian Janikowski field goal, giving the Seahawks their first lead of the game. Well you have to hope this is like a lot of other Seahawks games through the years with the slow start and then a fast finish. Seattle has just five yards on nine offensive plays and no first downs. Dallas has 88 yards but has had to go long fields and has turned that into just three points and has gotten past midfield just once. Michael Dickson the MVP so far averaging 52.3 yards per punt. That’s been a lifesaver for Seattle. 0:00 | Cowboys 3, Seahawks 0 The Seahawks go three-and-out once again as the first quarter comes to a close. Seattle has five — 5 — total yards after one quarter. To add to that, on the penultimate play of the quarter, Russell Wilson got dragged down by his facemask, with no call from the officials. 7:38 | Cowboys 3, Seahawks 0 Play has been stopped for a while now as Cowboys receiver Allen Hurns is treated on the field and taken away on a cart after a brutal injury to what looks like his ankle. FOX made the decision to show the replay. We won’t include it here. It is gruesome, to put it lightly. 9:50 | Cowboys 3, Seahawks 0 After getting gashed for three-quarters of the field, the Seahawks defense clamps down inside the 25 and forces a 39-yard field goal for the game’s first score. 13:11 | Seahawks 0, Cowboys 0 Dallas is driving on its first possession and crosses midfield with a reception to Cole Beasley. But Beasley, who’s been hampered by an ankle injury, is slow to get up. He eventually walks off the field, but per the FOX broadcast, goes to get his ankle inspected. 3:49 p.m. Guard J.R. Sweezy indeed made it back to play against Dallas, as coach Pete Carroll had confidently said he would all week. Sweezy suffered a foot injury against the Chiefs on Dec. 23 and sat out last Sunday against Arizona. But Carroll had said he was confident Sweezy would play, even though he had been listed as questionable and even though he said the injury is usually one that takes 3-4 weeks from which to recover. Sweezy conducted a workout on the field about two hours before the game under the watchful eye of offensive line coach Mike Solari, which was apparently enough for Seattle to give him the go ahead. His return means the Seahawks will be able to field their usual offensive line for the first time since a Dec. 2 win against the 49ers. D.J. Fluker was injured in that game and has not started since but is expected to return to the starting lineup today. Seattle allowed a season-high-tying six sacks last week against Arizona when only two offensive linemen played in their usual spots — center Justin Britt and left tackle Duane Brown. The return of Sweezy and Fluker also means Germain Ifedi will now return to right tackle after he played guard last week. Seattle’s seven inactives were: fullback Tre Madden, cornerback Kalan Reed, running back Bo Scarbrough, tackle Elijah Nkansah, receiver Malik Turner and defensive ends Branden Jackson and Rasheem Green. 3:00 p.m. We’re just over two hours from kickoff in Dallas and the doors are open. It’s a mad dash to get in AT&T Stadium. Stone: Starting point in Seahawks’ turnaround? You can blame their playoff FOMO. Where does the Seahawks’ surprise season rank in Seattle sports history?